I seem to remember reporting solemnly on the events of Big Al’s third birthday on this very blog. Well: this September ushered in his seventh. Life is insanely busy and it was not until 6:30pm on a balmy September Wednesday evening that I found time to post the present and card in the panniers and jump on the bike to pedal down to the nearby house of my quicksilver, indispensable nephew. I parked the bike outside and my sister opened the door. “Al!” she hollered. “Come and see what Auntie Kate’s got! She’s come to say Happy Birthday! A small figure wearing a small pair of underpants and a beatific grin (one of his favourite lounging outfits) appeared at the door.”Hello Auntie Kate!” he beamed hospitably. I surmised it had been a good birthday. But my sister confided it had not started well. Al loves presents, but he’s not big on change. Birthdays are irregular, and if you’re not careful everything is different. He opened his first present: a state-of-the-art three-wheeler scooter. But it was just too new to countenance. Al, his mother reports, scowled thunderously. When all is darkest, and tempers are frayed, there sometimes comes a tiny window of time in which listening is the only way out. My sister calls it ‘The Teachable Moment’. She waited patiently for it to appear, and, like an expert meteorologist, gauged exactly when the clouds would clear and she could talk a little sense into Big Al. She picked up an old tea towel and folded it up. Al wrinkled up his nose. Mother and son smiled. They had this covered. All day, Al had been delighted and amazed and really very pleased indeed, so much so that the actor’s union Equity should have offered him membership free for a year. Some presents had been great and some a bit so-so, but they all got the Olivier treatment. 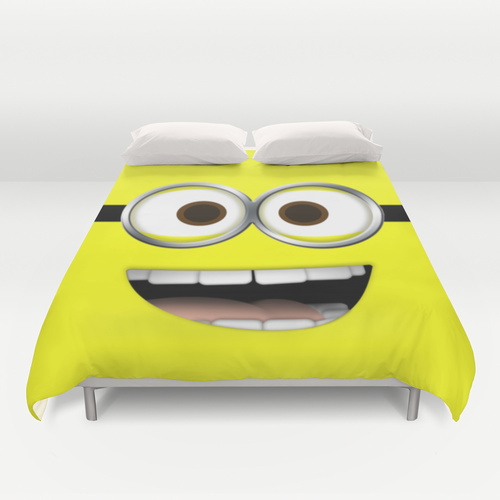 I arrived and watched him receive a duvet cover covered in Minions from Grandma and before he even knew what it was – he loves minions – he was already telling her how brilliant the package was. It was drawing near to Big Al’s bedtime. I slipped out quietly, before he could tell me just how wonderful and amazing was the bedroom lamp I had bought for him. Posted in Big AlBookmark the permalink. What a lovely surprise gift, a Big Al post. Can’t believe its four years since I started writing about him, Lou! I shall pass on the best wishes of Al’s favourite Lizard-lady, Andra. Oh, to have lizards living here in the UK. We only have newts and they skulk in ponds, which doesn’t impress Al one jot. Aw, lie schmie, Nancy 😀 Life is a social dance. If we said what we thought all the time we’d be social pariahs….well, I would, anyway…I am reminded of the autistic young man who was at a party where we were. A really warm, lovely young man. It was a radio station party and one of the ageing DJs was there with his latest young girlfriend on his arm. Our young man stood there and said precisely what everyone was thinking: “Of course, she’s an awful lot younger than you, isn’t she?” Awkward. But memorable. But awkward. As for the comment to the DJ . . . I love it! Perhaps people wouldn’t make so many peculiar choices if we all emulated that warm lovely young man in his efforts to encourage the emperor to put on some clothes. Thanks Sidey 😀 I’ll pass it on. My sister is one of the quiet geniuses of life, BB. She has to be. I hope Big Al has a brilliant birthday. Hi Gale! Thank you, I’ll make sure his mum reads this and passes it on! 😀 The boy is a never-ending source of material, Celi. And also, rather great cuddles. Big Al stories are second only to Macaulay stories from my point of view, and this one was delightful. Glad you enjoyed it, Karen 🙂 Al is on top form right now. Big Al is clearly a fast learner in the faking it department. Could we have a future prime minister in the making, Kate? Ha! His mother would have to be a very close adviser if he ever made it, Virginia! Good advice for Al. As our world gets madder and madder, it’s best not to piss any one off..you just don’t know what they might do. :) I put a smiley face, but it’s not that funny. I think we all have to be a little canny most of the time, Roger. In-your-face honesty can be unsettling, and it can, on occasions, make enemies. Best, as you say, to adopt a moderate approach. 😀 There was method in my madness….Al is very worried about the dark and he had broken his bedroom lamp so his mum asked if we could buy him one as a birthday present. Wonderful way to practise for the stage! It is SO frustrating when one goes out of the way to find a special present, and it is laid to one side and the packaging is played with. Mind you, maybe de light here would haves switched him on. I think on this occasion, it might, Col. But it is so exhausting being delighted with one’s presents all the time, and I thought, why not gee Al a much needed break? My goodness; seven years old, already! Well, now, he’s made the most of it and learned the delicate art of a gracious thank you. Lovely, Kate, as a Big Al story always is. Congratulations to the birthday boy. Thank you, Penny. I know my sister is reading comments and will pass on your congratulations to Al. He had a great day, all in all. Cindy, I have to pinch myself to realise I have been writing about Al for so long. Still: he still seems very little to me. I love the way your sister is teaching Al about some social graces. I sometimes cringe when the girls don’t show enthusiasm even for gifts they like. They seem to get a bit self-conscious when opening presents and then don’t even say a good thank you! I’m going to have to think about how to do a little coaching on the side–Sophia turns 7 in October. You’ve inspired me. Happy birthday to Al. He is such a charming and fun little boy–growing up rather quickly!